I am not sure when I first became convinced that God had a mission for me in life and that God was protecting me from serious harm. That realization has sustained me through thick and thin in all of my relations with people and institutions throughout all my adult life. Perhaps that realization began to assert itself in my consciousness when a large piece of shrapnel from the German 88mm antiaircraft shell that exploded just outside my window in the tail of the B-17 on my fourth mission over Germany and struck the beam supporting the tail inches above my head and fell on me; if it had hit just a few inches lower it would have taken off my head. I have been involved in three automobile accidents in two of which the vehicle was totally demolished. In one case after being forced off a narrow road by an oncoming car at night my car hit a concrete culvert, the air bag failed, the seat belt failed and my head tried to go through the windshield. My only injury was the rupturing of the S-1 disc at the base of my spine which left me with sciatica. In an earlier accident my Ford Bronco rolled off of a hill in Wyoming and was totally demolished. My only injury was a cut on the little finger of my left hand. I have had encounters with grizzly bears in Montana and sharks and barracuda in the Florida keys and have come away unscathed. I have been caught in violent squalls while sailing a small sailboat in the Atlantic and I have had a 16 foot motor boat lose its engine in the middle of the Gulf Stream off Florida in 10-12 foot seas. In my outdoor activities all my life I have narrowly escaped death many times. But it was in flying that I came to realize that God is truly my “Co-pilot!” One cannot fly by Instrument Flight Rules all over the United States in all kinds of weather without at one time or another coming close to death. I will only recount three of my experiences which, added to all the others, have convinced me that God has kept me alive in order to do his will. It is my hope that my writing this autobiography is part of what God has kept me alive to do. The first was when I was in the monastery. in the winter of 1958-1959 I had a severe case of bronchitis. The doctor had prescribed codine to control the coughing. I was on top of a mountain in a cabin during Christmas break. I got chilled. Another monk gave me a small glass of wine to take the chill away. There was a synergistic effect of the wine on the codine and I stopped breathing. I started turning blue. Someone drove down the mountain and called for an ambulance. While we waited for the ambulance I had a near-death experience in which I looked down on myself dying. The ambulance arrived and drove me 30 miles to the hospital in Latrobe. On the way I drained the oxygen tank in the ambulance and survived. On May 15, 1976 I was scheduled to give a speech to the annual meeting of the Provincial Council of Catholic Women which was being held in a hotel on the beach of Hollywood, Florida. That morning I went to the Flight Service Station of the Federal Aviation Administration at the Tallahassee Airport and got my weather briefing. The told me that an occluded stationary front was located across the peninsula from Fort Myers to Melbourne. They said the front was very broken and that I should have no trouble passing through it on my flight to Miami. What they did not tell me was that on the southern side of the front the lifting index for moisture was very high; that meant that clouds, big clouds, thunderstorms would build up as the day progressed. Not knowing this I filed my flight plan to fly solo at 9,000 feet from Tallahassee to Miami. All went well until I passed Orlando, then I began to fly continuously on instruments in clouds. Before too long I encountered severe turbulence which indicated to me that I had entered a cumulus nimbus cloud that had become a rain storm. A little while later I entered the first real thunder storm. I knew that it was a thunderstorm because I was surrounded continuously by blinding lighting flashes and very heavy rain (I learned that you do not hear thunder in the middle of a thunder storm, you only hear it when you are on the ground.) I became worried that lighting might strike the plane although I knew that that rarely happens but the rain was a greater source of worry because I realized that the water might plug up the air intake for the carburetor and the engine would die. I called air traffic control and asked them to give me a deviation around the thunder storm. They replied that their radar was painting solid thunderstorms in my area and that there was nowhere they could deviate my flight path that take me out of the storm. After a few minutes I flew into a bigger cell and this time I began to experience the violent updrafts and downdrafts that are characteristic of a major thunderstorm. The velocity of those air drafts can reach over 200 miles per hour. the plane was being tossed about like a feather. On the radio I could hear commercial airline pilots flying at 25,000 feet altitude above me asking for deviation and being told by the air traffic controller the same thing I had been told. After a few minutes, after what seemed like an eternity, I exited that cell only a few minutes later to enter an even larger cell. The Cessna Skylane 182 does not have an autopilot, it does however have a “wing-leveler” device which, when engaged, keeps the wings level but it does not control pitch and so the pilot has to keep the nose level. In this major cell my plane was either dropping 1000+ feet one minute or rising 1000+ feet a minute. The G-Forces were tremendous; one minute I was squeezed down into my seat and the next minute my head was hitting the ceiling of the airplane even with my seat belt fastened. I blacked out, I lost consciousness! I do not know how long I was unconscious. When I came to I was still in the middle of the thunder storm cell. I immediately checked my instrument panel to see if I was spinning and falling. To my utter astonishment I was flying straight and level but had lost two thousand feet of altitude. I put the plane into a slow climb and regained my assigned altitude of 9,000 feet. A few minutes later another blackout was repeated and when I recovered again I was straight and level but over 2,000 feet lower. Shortly thereafter I exited that major thunderstorm and from then on only encountered turbulence as I passed through rain showers. I landed at Opa Locka Airport exited the airplane, secured it to the ramp and walked to the general aviation terminal. It was then that my legs started to buckle under me and I experienced disabling fatigue. I called the hotel where I was to speak and asked the desk clerk to get word to the ladies that I was sick. I checked into the nearest motel and collapsed in bed. I woke up the next morning and flew back to Tallahassee VFR in clear skies. Shortly after takeoff I engaged the wing-leveler only to have the plane make a sharp right turn. After several more failed attempts I flew completely by manual control all the way back to Tallahassee. When I landed I had my mechanic check what was wrong with the wing-leveler. He told me later that the shear pin in the mechanism of the wing leveler had been sheared in two. If the shear pin had fully sheared in the thunderstorm I would have crashed. It only partially sheared in the storm and finally sheared in two only the next day as I was flying back to Tallahassee. God was truly my Co-pilot on that trip! The second near-death experience was when I was flying from an Apostleship of the Sea Conference in Oakland, California to Washington for another Conference. On the way I flew from Cheyenne, Wyoming to Kansas City, Missouri. When I approached Kansas City the air traffic controller told me that the airport in Kansas City was closed because of weather. I explained that I was running low on fuel and I needed the nearest airport at which I could land. He said that the recently opened Kansas City International Airport about 50 miles north of Kansas City was still open but would probably close soon because of the lack of visibility. 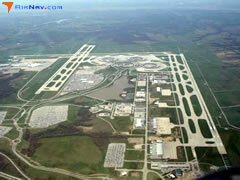 I flew to Kansas City International Airport and made an instrument landing in constantly shifting crosswinds. I never saw the runway. I dimly saw runway lights when I was guess I was about twenty-five feet above the ground, I turned slowly and slowly descended on what I hoped would be the runway. It was. The control tower, after a few minutes, thinking I may have crashed started calling me. I answered. He asked if I was ok. I said I was. He asked where I was. I said, “I don’t know where I am” He said, “Are you on the runway?” I replied, “Yes, my landing lights are shining on asphalt.” He said, “Taxi to your left until you come to a lighted sign with a letter indicated which taxiway you are at.” I did as he told and I called back after a few minutes and told him, “I am at intersection “D.” He said, turn left and I will guide you to the terminal. I did, he did and I arrived at the terminal in 0/0 visibility. I did not see the terminal until I was about a hundred feet from its lights. Seek to do the will of God in your life, no matter what the circumstances. Even though you may tempt God by reckless and foolish choices and decisions you make as you live your life, if you truly, consciously seek to do his will you will be pleasing to God and he will get you out of the mess you occasionally get yourself into. Trust God to use you as Jesus used the spittle and dirt to make the mud that he applied to the eyes of the man born blind. We are after all clay in his hands to which he has miraculously given the power or intellect and free will which makes us be God-like. Be living mud in his hands.